Today was a long day. My daughter has croup (which we found out when she woke up wheezing late Sunday night/early Monday morning) and Sunday night was filled with worry and very little sleep. Thankfully, she is doing much better now and I'm hoping that we will all sleep better tonight. I had every intention of sitting down to work on one of the many wonderful challenges that I have had my eye, but it's not going to happen. My brain is running on auto-pilot - time to post this puppy and go to bed! Anyway, enough about me! On to my card, which is a reincarnation of this card from a couple of months ago, with a little twist. 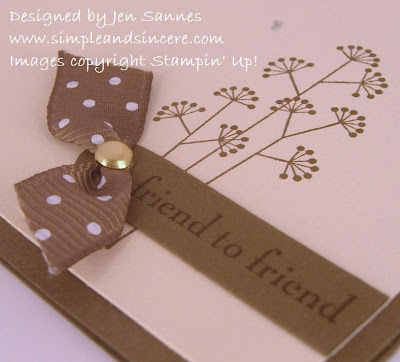 We made this card on Saturday, during my Clean & Simple stamp-a-stack. I have to say that I have really become quite fond of Soft Suede. 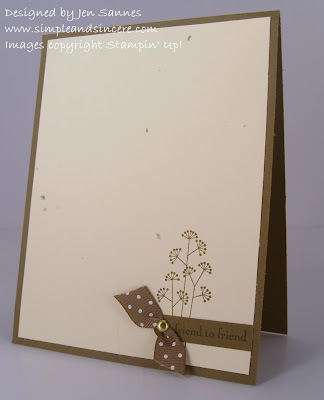 At first, it was my least favorite of the latest In Colors, but it is such a lovely neutral - so many possibilities... I'll try to have something new for you tomorrow - have a fabulous day!